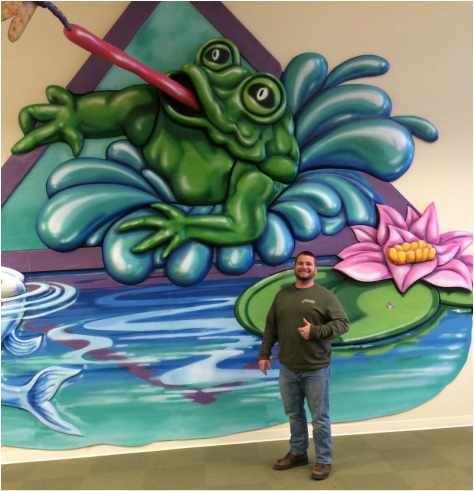 River Bed Builders LLC​​of Kentuckiana - Frog Blog! Before installing a water feature, many ask questions about the winter time. What do I do with it in the winter? Will you come out and winterize? Is it going to be high maintenance in the colder months? Will my fish be okay if my pond freezes? These are all legitamate concerns, but winter will not wreck havock on your feature if you thoroughly prepare. Planning for the cold and taking precautions will be your best weapons to any threat of winter. For your pond, the best thing that you can do to prepare for wintry conditions is to run a de-icer and an aerator with a diffuser stone. Place the aerator on a shelf and not at the bottom of the pond, this is to insure that the thermal water is not disturbed. Begin running the aerator before it gets too cold. This way it is already in the pond before it freezes. The aerator will be pumping fresh air into your water providing oxygen to the fish. Be sure to place the de-icer above the aerator. When it does get to that freezing point, the de-icer will keep a nice opening for the release of harmful gases. If you have a pond, you might be asking if you need to take out the pump. If you typically have very cold winters, we recommend removing the pump as to help prevent any damage to it during the winter months. Once removed from the pond, be sure to keep the pump in a freeze free place and in a bucket of water. If you live in an area where the winters are rather mild, it is okay to leave your pump in and to keep the pond running throughout the season. If you have an abnormally cold day and have chosen to leave your pump running, be sure to add water to compensate for any ice formations. What about the fish? Your pond should be at least at a depth of two feet or more to keep them safe during the freezing temperatures. If your pond does freeze over, just be sure to make a hole in the ice so that your fish can “breathe” safely. As for the frigid temperatures, the fish will be just fine, even if you can’t see them. They actually enjoy the cold. For those who enjoy having a pondless waterfall, the maintenance is pretty simple. For very cold areas, we recommend that you close your feature for the season. This means removing the pump and the check valve. Be sure to store these in a freeze free zone in a bucket of water. If you live in a milder climate, you can continue to keep your waterfall running. Just be sure to keep an eye on the amount of water in your basin. You want to have enough to compensate for any ice that may form during a frigid week. You can also add a de-icer in your pump vault for extra protection against damage to your pump due to freezing. Also be sure to watch for ice forming in your waterfall stream. This may lead to water escaping and then a dry basin causing harm to your pump. With a water feature, the winter can sometimes be intimidating, but if you take the proper steps to care for it you will have nothing to worry about. Knowing this time of the year can be very busy, we can help by winterizing your feature. Please call us today to set up an appointment! Thoughts and questions are welcomed. Feel free to comment below or e-mail us. Each spring the plants start to bloom, our fish come alive again and green slowly begins to take over the dullness winter had brought. Green can be an exciting sight to see, but it isn’t favorable among most pond owners. Seeing algae form on your rocks is not quite what you had pictured from the year before. Leaves have taken home to the bottom, and your pond just doesn’t carry its glowing appeal from where you thought you had left off. No worries, this can be fixed in no time. A spring clean out is just the solution. 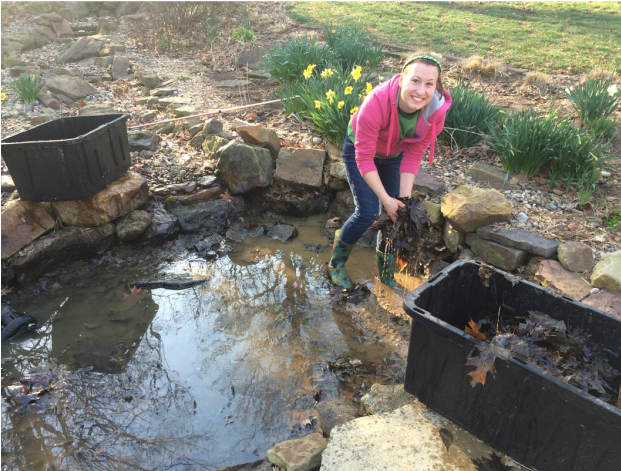 Cleaning out your pond may seem like a dreadful task, but on a nice warm day it can be just the way kick off your spring season! In just a few hours you can take your water feature from murky to perky and ready for enjoyment. You will need a few tools to help you with this project, nothing too complicated. You will need a water pump and a hose for pumping out the water, a net for removing the fish, a tub to put the fish in (a cattle trough works nicely, but never use a trash can), an aerator for those fish, and a hose with good water pressure or a pressure washer for cleaning. It is also a good idea to wear waders or waterproof boots. With these things compiled, cleaning will be a breeze. First things first. The purpose for doing a spring clean out is to get rid of the nastiness that has built up from the previous year or years, if you haven’t cleaned in awhile. So, in order to make this happen, the pond will need to be drained. Place the pump into the pond, on the closest shelf to the top, if possible, to avoid debris that may be compiled at the bottom. Begin draining the water, placing it at first into the tank that you plan to keep your fish in for the cleaning process. Once the holding tank has been filled, put your aerator in. You can then begin to transfer the fish with your net from the pond to your holding tank. As the water gets lower, the fish will be easier to catch. With the remaining water being drained, it is wise to water your surrounding landscape or garden. This water is full of nutrients and will make for excellent fertilizer. Once the water has been drained, you can start the cleaning process by removing the leaves and twigs that may have gathered during the off season. (To avoid this step next time, put a net over your pond to capture the leaves in the fall.) After most of the debris has been removed, you may begin rinsing the rocks moving from the top to the bottom, rinse not only the surface, but behind the rocks as well. This will help to rid the gunk that has built up. It also is a good time to check your filters and pumps. Be sure to rinse these areas and make sure that they are working properly. If maintenance needs to be done, now is the best time. As you continue to rinse, water will build up in the bottom of your pond. Go ahead and drain this water as ofter as you need to. The purpose of rinsing is to wash the gunk to the bottom and then to drain that murky water out. Do this as many times as necessary. If your pond has not been cleaned in awhile or looks excessively dirty, you may need to use a pressure washer for the final rinse. When the water become more clear, you are ready to move on. 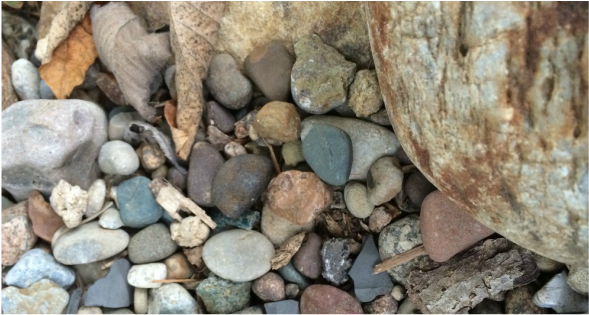 The rocks should not be “sparkling", but look naturally green. It is healthy to leave some of the green for the fish. When your water has shown to be “clean”, you may begin filling your pond back up. When the pond is full, you will need to add some detoxifier. Detoxifier will dechlorinate the water and make it safe for the fish. You may then begin acclimating the fish to the new water by taking out about half the water from your holding tank and adding the new water. Wait about ten minutes to allow them to get used to the new water. Once you feel that they are ready, you can start adding them to your clean pond. Try adding just one at first. See how he handles the new environment. If all is well, add the other fish. When you are finished, turn on your feature. Look at the beauty you have resurfaced. Sit back and enjoy. For any questions or comments, feel free to leave us a note. We would love to hear from you! With excitement, we loaded the car and hit the road. We anticipated a smooth ride through Indiana and into Illinois as we traveled to the watergarden capital of the world. Aqualand, here we come! Full of hope, we journeyed knowing that this trip would lead us onward. As we approached Indianapolis, my sister texted us warning of the snow storm headed toward the Chicago area. They were expecting up to five inches of snow with high winds likely. At this point, there was no turning back. Our hotel was booked, and our plans were set. About an hour outside of Indianapolis, the snow began to fall. Slow at first, then by the time we hit Lafayette white was all we could see. The wind blew fiercely. Windmills were really spinning, and Andrew's knuckles were about as white as the snow hitting the road. It was a scary drive for a very long 4 hours after that. Bumper to bumper traffic going at a maximum speed of 30 miles an hour all the way to Chicago. Talk about a long trip. By the time we made it to St. Charles, there were 4 inches of fresh powder covering the ground and no plow had touched our hotel parking lot. It was a crazy mess. We were exhausted. We settled for some less than great deep dish Chicago pizza and then went right to bed. We were happy that we finally had made it! The next morning, I dropped Andrew off at Aqualand for his first day of Aquascape Academy classes! He was excited and intimidated all at the same time, but the welcome of the people made the transition from outsider to comrade come at ease. At Aquascape, as you enter the doors, there are a variety of ponds that have been built to enjoy. There are koi swimming and turtles! There are turtles basking in the sunlight! There is even a dog that comes around to greet you. What a place! It is extraordinary. The energy of Aquascape and its people is thriving. The company is focused on its employees and their well-being, and for that there is appreciation, which truly shows. As introductions began, and classes formed, people became acquainted. Novice to skilled contractors from all regions as well as different levels in their careers gathered ready to dig deeper into the industry that Aquascape has so proudly expanded. As leaders of the training program, Chris and Trent started the class, Greg Whittstock, Aquascape founder, introduced himself as well. His passion and enthusiasm were downright sincere. His excitement for this business and the success of others in it cannot be masked. The two day training was packed full of information, almost overwhelming. The classes covered material from edge treatment techniques to keeping a solid ecosystem in your pond and even advice on how to run your business successfully was given. The training was educational and hands-on. Andrew was excited to be a part of the first group to get into the sandbox. The sandbox is Aquascape’s indoor area made for training purposes. In a matter of hours, the group had built an 8X11 pond, a 6 foot pondless waterfall, and a fountainscape. Proving that done the Aquascape way, each feature can be done with a three man crew in a as fast as a day! On a final note, Greg Whittstock challenged the class to keep our BUTS out of the way. Stay focused on building beautiful features for good people! Let’s makes it a great year! River Bed Builders designs and installs waterscapes. Located in southern Indiana, we install and maintain water features in the Kentuckiana area. Please feel free to leave us a note and share your passion for water too! When I was in the second grade my teacher gave our class an assignment: What Do You Want To Be When You Grow Up? It is a question in which we all ask ourselves at some point in our lives. At the age of only 7, it was clear. I was going to be a pet shop owner. Okay, so maybe it wasn’t exactly clear. But, I did know a few things for certain. I did love animals and plants, and I most certainly loved being outdoors. Exploring with what I could build with my hands in the dirt and rocks as a child was what I loved to do most. In the library one day, I discovered a book on watergardens. I brought the book home with excitement to show my parents. Looking through the pages, I imagined how cool it would be to have a pond in my own backyard- the fish swimming around with the frogs as they jumped in from the edges. I begged them to let me build one. My parents were supportive. My mom took me to a friend’s home where they had a watergarden. It was the first time that I had ever seen one in person. It was breathtaking. I was just a boy, but I was inspired. The small pond was filled with blooming beautiful water lilies and colorful koi and goldfish. Frogs jumped in and swam around like little divers. It was full of life. My dad told me that if I really wanted to build a pond of my own that I would need to dig the hole for it. He would help me with the rest, but for the hole, I was on my own. Now, at age 12, this was a major job, but I was serious, and I meant business. I dug the hole, and the rest is history. Digging that initial hole for each project has gotten easier with practice, but I still get that same satisfaction when I’ve completed a job just as I did that very first time. Now that I’m all “grown up”, I’ll admit that I haven’t stayed as true to myself as I’d wish I would have. I’ve spent most of my days stuck inside working a job where my passion has fizzled out. When I graduated from high school, I had high hopes of opening my own auto body repair shop. As you can see, my entrepreneurial spirit has always been alive and well. I have pursued that path for some time now, but change is in the winds. River Bed Builders is my dream coming to life through ponds, streams and fountains. My journey is just beginning. I am truly excited to be working in an environment that I absolutely love. Building beautiful waterscapes that people can enjoy brings such a reward in itself. When a customer is ecstatic about a completed project, I feel on top of the world. Being able to provide that for them and myself is amazing. Who knew following your heart could feel so great! ?